We have all been receiving huge planetary downloads in recent months and the biggest is yet to come with the opening of the Stargate or Lionsgate portal on August 8th 2017. Things in our lives may have shifted and we may be feeling unsure or uncertain of what’s ahead. Lionsgate opens every year on August 8th to the 12th, when the Sun is in Leo and is marked by the star Sirius moving closer to earth and aligning in Orion’s belt, which perfectly syncs up with the Pyramids in Giza. At this time of the year Earth aligns with the Galactic Center of the Universe to create an extremely favorable portal for the acceleration of the ascension energies that are within us. Powerful activations have been taking place over the past month to prepare us for now. All lower vibrational energies and emotions brought to the surface to transmute through the higher soul star chakra and higher heart chakra. Old timelines brought forth to heal old wounds through forgiveness of self and those who caused the wounds. Further inner child healing has occured through this phase. Anger, fear, anxiety, judgement, projection of others, feelings of worthlessness, a feeling of giving up and hiding away, running away, feeling misunderstood and desperation, feeling alone. You may have felt you had to deal with it all alone, and you did. As one does not realize the inner strength of oneself unless there is no choice but to do so. Stay open without judging anything you experience, your human mind will interfere, discern and feel instead of thinking, be ready to share what you receive and allow your being to align with who you truly are and with the cosmic knowledge that is being poured into you at all times – for you to become the Cosmic sovereign being that you decided to be. The vehement frequency of this new month, will literary hit our human self to help us see in what places are we not choosing to be the New Earth Masters that we are becoming – creating separation and the illusion of lack and what should be synthesized within and in our physical life experiences. This can come in the form of a challenge but as always, these are just Divine gifts for us to keep detaching ourselves from what should remain in the old and embrace what we truly desire to manifest in our new reality. In numerology, this month is also a Universal 8 number. We have the same message of creativity and boundless resources. The energies coming from the infinite magic 888 numbers gives us the courage to give birth to our inner worlds and anchor them in the physical. It is a time in which these energies will show us what we need to unify and release, as lack is also created by the human illusion that there is not enough and it will be an opportunity for us to be aware of where we create plenitude and where absence of it. It is all what you create at every moment in your own reality, not what you consider that happens to you, but what you make and how you react about what occurs, this is why is so important to observe your own self and everything that happens, so you can discern and choose what path to follow. In a month ruled by Leo, number 8, is also represented by the fiery tarot card of strength –a woman holds between her hands the jaws of a Lion (sun) – is it physical strength or the inner one that can only come through the power of love, wisdom and balance? 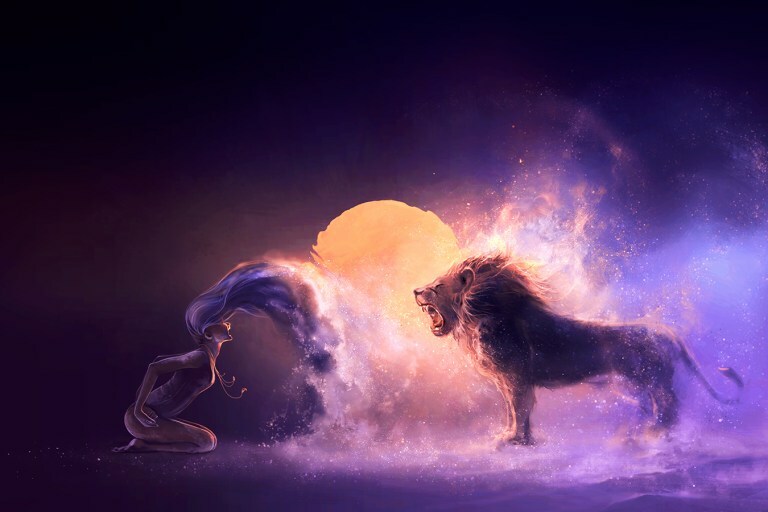 This is the perfect representation for the Wise Goddess of Love embracing fiery Leo, calming his wildness with her loving essence. The message to me, is that all can be done through the power of love, all can be shifted and dissolved when our human self finally surrenders to a Higher Power that is within All things and beings, and let it lead the way. I agree about Leo being a sign of ferocity and strength.